Colo Colo is a historic tugboat of the Chilean Navy built in Scotland for Chile in 1931. She was a steamship until she was reconditioned in 1971, at which time she was re-engined as a motor vessel. She spent her service career in southern Chile. During the Chilean naval mutiny of 1931 she chased the Chilean submarine Rucumilla near the Quiriquina Island. In 1987 she was withdrawn from service and preserved at the Chilean Navy Museum at Punta Arenas. ^ a b c d "Colo Colo, remolcador (4to)". Armada de Chile. 13 February 2009. Archived from the original on 21 October 2010. Retrieved 22 May 2011. ^ a b c d e f g h i j k l m n o p Cameron, Stuart; Asprey, David. "SS Colo Colo". Clyde-built Database. Retrieved 2011-05-22. 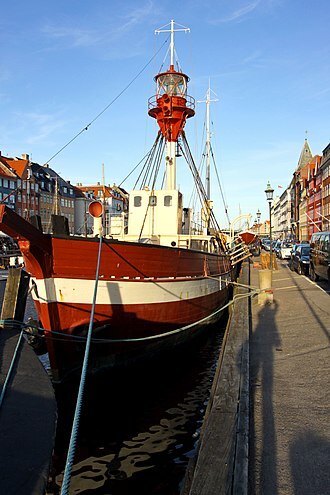 Joseph Conrad is an iron-hulled sailing ship, originally launched as Georg Stage in 1882 and used to train sailors in Denmark. After sailing around the world as a yacht in 1934 she served as a training ship in the United States. Australian sailor and author Alan Villiers saved Georg Stage from the scrappers, Villiers planned a circumnavigation with a crew of mostly boys. Joseph Conrad sailed from Ipswich on 22 October 1934, crossed the Atlantic Ocean to New York City, down to Rio de Janeiro, Cape Town, and across the Indian Ocean and through the East Indies. After stops in Sydney, New Zealand, and Tahiti, Joseph Conrad rounded Cape Horn and returned to New York on 16 October 1936, having traveled a total of some 57,000 miles. Villiers was bankrupted as a result of the expedition, and sold the ship to Huntington Hartford, heir to the A&P supermarket fortune, who added an engine and used her as a yacht. In 1939 Hartford donated the Conrad to the United States Coast Guard for use as a ship for the merchant marine based in Jacksonville. SS Robin is a 350 gross registered ton steam coaster, a class of steamship designed for carrying bulk and general cargoes in coastal waters, and the oldest complete example in the world. One of a pair of coasters built in Bow Creek, London] in 1890, the ship was built for British owners, in 1974 she was purchased for restoration as Robin and is listed by National Historic Ships as part of the National Historic Fleet. She is situated in the Royal Docks in east London, in the stages of preparation before opening as the SS Robin museum, theatre. 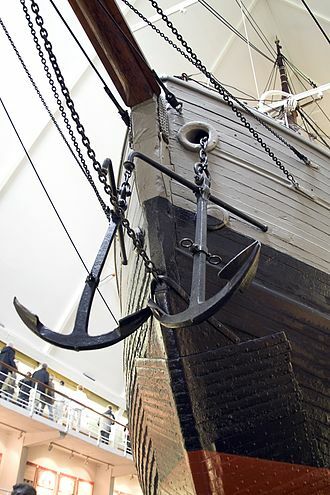 As built, Robin was 143 feet long, her beam is 23 feet, her depth is 12.2 feet and she carried about 450 tons of cargo. The engine is a triple expansion steam engine, developing 152 indicated horsepower. Her maximum speed was 9 knots, in Lloyds Register she was described as a steel screw 3-masted schooner, and had indeed been provided with sails for all three masts when first built. However and her sister Rook were completed by Thomson himself, after fitting out in the East India Dock, Robin was towed to Dundee to have her engine and auxiliary machinery installed by Gourlay Brothers & Co. When completed she was registered in London with Official number 98185 and in the ownership of Arthur Ponsonby of Newport, on 20 December 1890, Robin commenced her career in the British coastal service at Liverpool, with a crew of 12 signing the Articles for her maiden voyage. As a coaster her range was limited to the Home Trade limits (broadly from the Elbe to Brest. In 1892 Robin was sold to Andrew Forrester Blackater of Glasgow, during World War I she carried iron slabs for the French government from the foundry at Santiago to Bayonne and Burdeos, escorted by two destroyers to protect her from German U-boats. From 1935 to 1939 the ship was laid up at San Esteban de Pravia, 1965–1974 Eduardo de la Sota Poveda of Bilbao, working around Bilbao] and the north coast of Spain until 1974, carrying coal for the bunkering of liners. Until 1965, Marias structure stayed mainly unchanged, in 1966 she had a refit with the whaleback and the mizzen mast removed, the foremast and the funnel shortened. The coal-fired furnaces were modified for oil fuel, Maria was discovered by the Maritime Trust in 1972. The displacement or displacement tonnage of a ship is the ships weight. The name reflects the fact that it is measured indirectly, by first calculating the volume of water displaced by the ship, by Archimedes principle, this is the weight of the ship. Displacement should not be confused with other measurements of volume or capacity typically used for vessels such as net tonnage, gross tonnage. The process of determining a vessels displacement begins with measuring its draft This is accomplished by means of its draft marks, a merchant vessel has three matching sets, one mark each on the port and starboard sides forward and astern. These marks allow a ships displacement to be determined to an accuracy of 0. 5%, the draft observed at each set of marks is averaged to find a mean draft. The ships hydrostatic tables show the corresponding volume displaced, to calculate the weight of the displaced water, it is necessary to know its density. Seawater is more dense than water, so a ship will ride higher in salt water than in fresh. The density of water varies with temperature. Devices akin to slide rules have been available since the 1950s to aid in these calculations and it is done today with computers. Displacement is usually measured in units of tonnes or long tons and these bring the ship down to its load draft, colloquially known as the waterline. Full load displacement and loaded displacement have almost identical definitions, full load is defined as the displacement of a vessel when floating at its greatest allowable draft as established by classification societies. Warships have arbitrary full load condition established, deep load condition means full ammunition and stores, with most available fuel capacity used. Light displacement is defined as the weight of the ship excluding cargo, water, stores, crew, normal displacement is the ships displacement with all outfit, and two-thirds supply of stores, etc. on board. Standard displacement, known as Washington displacement, is a term defined by the Washington Naval Treaty of 1922. 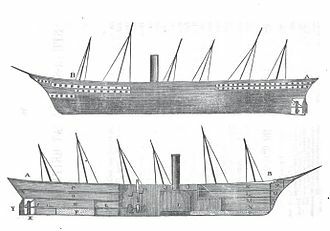 Turbinia was the first steam turbine-powered steamship. 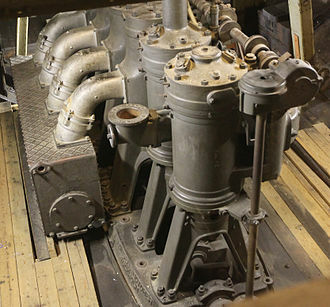 The vessel can still be seen at the Discovery Museum in Newcastle upon Tyne, North East England, while her original powerplant can be found at the London Science Museum. Charles Algernon Parsons invented the steam turbine in 1884, having foreseen its potential to power ships. To develop this he had the experimental vessel Turbinia built in a design of steel by the firm of Brown and Hood. The Admiralty was kept informed of developments, and Turbinia was launched on 2 August 1894, despite the success of the turbine engine, initial trials with one propeller were disappointing. In trials this achieved a top speed of over 34 knots, the turbines were directly driven, as geared turbines were not introduced until 1910. Even after the introduction of geared turbines, efficiency of even the largest axial steam turbines was still below 12 percent, Turbinia was even less efficient, with its direct drive turbine moving with a tip speed of just 30 meters per second. Despite this, it was an improvement over predecessors. Photographer and cinematographer Alfred J. West took several photographs of Turbinia traveling at speed at the Review. 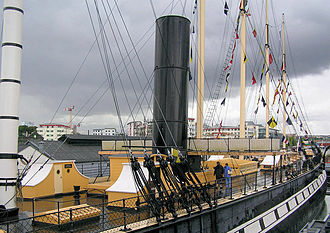 Both vessels were lost but although the loss of these trials ships slowed the introduction of turbines, in 1900 Turbinia steamed to Paris and was shown to French officials and displayed at the Paris Exhibition. The first turbine-powered merchant vessel, the Clyde steamer TS King Edward, the Admiralty confirmed in 1905 that all future Royal Navy vessels were to be turbine-powered, and in 1906 the first turbine-powered battleship, the revolutionary HMS Dreadnought, was launched. On 11 January 1907, Turbinia was struck and nearly cut in two by Crosby – a ship being launched across-river from the bank of the Tyne. She was repaired and steamed alongside RMS Mauretania after the launch of the ocean liner. However, mechanical problems prevented Turbinia from accompanying Mauretania down the River Tyne to the sea, the fore section was presented in 1944 to Newcastle Corporation and placed on display in the citys Exhibition Park. Punta Arenas is the capital city of Chiles southernmost region and Antartica Chilena. The city was renamed as Magallanes in 1927, but in 1938 it was changed back to Punta Arenas. It is the largest city south of the 46th parallel south, as of 1977 Punta Arenas has been one of only two free ports in Chile. During the remainder of the 1800s, Punta Arenas grew in size and importance due to the maritime traffic. This period of growth resulted from the waves of European immigrants, mainly from Croatia and Russia attracted to the gold rush and sheep farming boom in the 1880s. The largest sheep company, controlling 10,000 square kilometres in Chile and Argentina, was based in Punta Arenas, since its founding Chile has used Punta Arenas as a base to defend its sovereignty claims in the southernmost part of South America. This led, among other things, to the Strait of Magellan being recognized as Chilean territory in the Boundary treaty of 1881 between Chile and Argentina. 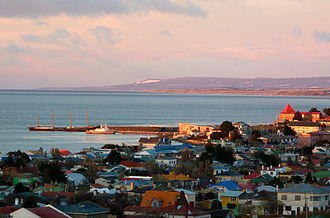 The geopolitical importance of Punta Arenas has remained high in the 20th, the English 18th-century explorer John Byron is sometimes credited with naming this area, calling it Sandy Point. But it was not until 1843 that the government tried to establish a fort, the name Punta Arenas was derived from the Spanish term Punta Arenosa, a literal translation of the English name Sandy Point. The city has known as Magallanes. Today that term is used to describe the administrative region which includes the city. 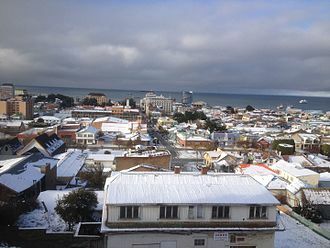 Punta Arenas has been nicknamed the city of the red roofs for the metal roofs that characterized the city for many years. Since about 1970 the availability of colors in protective finishes has resulted in greater variety in the characteristic metal roofs. 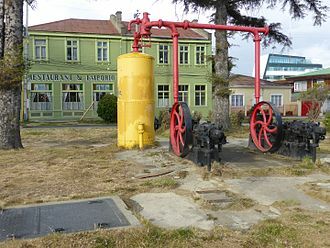 Located on the Brunswick Peninsula, Punta Arenas is among the largest cities in the entire Patagonian Region, in 2012, it had a population of 127,454. It is roughly 1,418.4 km from the coast of Antarctica, the Magallanes region is considered part of Chilean Patagonia. Magallanes is Spanish for Magellan, and was named for Ferdinand Magellan, while circumnavigating the earth for Spain, he passed close to the present site of Punta Arenas in 1520. El Mahrousa, officially renamed for a period of time as El Horreya, is a super yacht that currently serves as Egypts presidential yacht, and before that as the countrys royal yacht. It was built by the London-based Samuda Brothers company in 1863 at the order of Khedive Ismail Pasha and it is the oldest active yacht in the world and the seventh largest one. 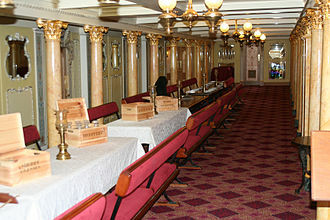 It witnessed much of Egypts modern history since it was first commissioned in the 19th century up till now. This marked the end of the monarchy in Egypt following the 1952 revolution, the ship continued to play a role in the countrys post-revolutionary history and participated in the 1976 United States Bicentennial celebrations. It took Egypts president, Gamal Abdel Nasser, to locations and it notably sailed with President Anwar Sadat to Jaffa, Israel. It was renamed back to El Mahrousa in 2000 and recently became the first ship to cross the New Suez Canal extension in 2015 and she was built by the Samuda Brothers on the River Thames and designed by Oliver Lang along the same lines as HMY Victoria and Albert II. 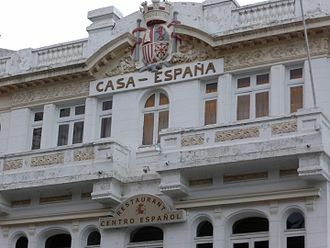 Casa España, established in 1917 by the Spanish Society of Socorros Mutuos. It was formed between 1936 and 1938. Plaza de Armas (Muñoz Gamero Park). Christopher Columbus Avenue, the location of the Old Machine House build in 1890 by Croatians. 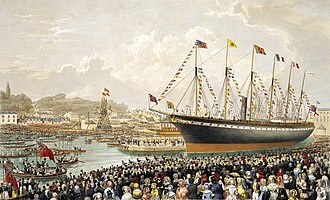 Turbinia at the Spithead Navy Review, 1897. Cruise ships on the Volga River, Russia.